1. The brides mother gives the bride a gold coin and the father gives her a silver coin. The gold coin is placed in the right shoe and the silver in the left. 2. The bride wears 3 rings, the first is the engagement ring, the second the is the wedding ring and the third is for motherhood. I think marriage in Sweden is very important and Swedes take marriage at a far higher responsibility than some cultures. It would be extremely out of the ordinary if an 18 year old were to marry or become engaged. Also, the size of weddings is smaller. It's very common that a couple would get married in a court house or take advantage of the beautiful nature and get married in a small park or whatever. Great question, Gran! :) Sorry I don't know much on the subject and neither does my Swede! :) But all in all, I think weddings here and there are really similar! Definitely a celerbation! The Swedish thing of the day is Guacamole. This is odd, but notice how different it looks. I think it looks like baby food! But it brings me to another point and it's Sweden's obsession with Mexican food. They have entire sections in grocery stores dedicated to Mexican food. You don't have to search around the store for beans and tortillas and sauce, it's all there in the same place. Even the smallest grocery store, you can find the "mexican section". The word of the day are "ica" and "hemköp". These are my two mosted go to grocery stores. There are a few others, but I don't facy them as much. :) It's just like in the US, you find the stores you like and go to to them. Ok it's super late but I just was so occupied these past 9 days. Occupied with spending time with Fredrik! Good excuse, eh! :) But I did do some fun things while I've been on hiatus...like make these cookies and brownies! Cookies I made for the girls before I left them! Some fudge espresso brownies, I took these to my friend Farzad and Misty. And some cowboy cookies. YUM! Took these to Fika with Fredrik's Mormor and Morfar. For Valentines Day I woke up nice and early and made some homemade biscuits and gravy, and I made my own sausage! Spiced it and everything! Go me! And I made a big delicious egg, bacon, cheese casserole. I also did a very corny thing and won't go into detail..but man, I have a good Valentines Day to top off next year! Sheesh! I forgot to mention a VERY Happy Birthday to my dad, who turned 35 the day before Valentines day, my mom who is a Valentine baby, and Leslie who celebrated the day after Valentines day! Grattis på födelsedagen to you all! Yes, I know some of you are wondering...why? I think we wonder the same thing when we see this video. I know a certain reader and germaphobe is going to be quite grossed out by this! :) I love the part when I try to trick him and say "click". Wow. We are silly. Oh and this is one of the beautiful presents Fredrik got me. The scarf I'm wearing on my head. Haha, had to show it off. I think taking silly pictures of ourselves is one of our favorite pass times. I love his beard and squinty eyes! I think we were trying to make our lips disappear! So all in all, it's been a great passed 9 days. I am so lucky I got to spend that time with my sweetie. He's one of a kind and I'm soooo lucky I snatched him up! I think the whole time I've been here we were waiting for a week like that. Now it's back to the grind! But, just as quickly as the time I came to Sweden arrived, it's ending just as quick. I only have 3-4 months left here. In the long run, that isn't much time left at all! With the days getting longer (even though we have LOTS AND LOTS AND LOTS of snow) the days will start flying by! Must enjoy them while I'm here! The Swedish thingof the day is a sign. I took this picture for some reason...but realized...to somebody who hasn't been living in Sweden for 7 months, this sign would just look ridiculous. It's kind of impressive that I can understand most of this. I usually get stuck on a word or two like in this sign. BUT, this sign says something along the lines of "what can my little self do for the environment." Swedes love to recycle. I'm gonna ask you. What are some Swedish words you would like to know? The Swedish word today is "fråga" which means "question" and is pronounced "froahga". Go ahead, answer, you know you wanna! Sorry sorry, I haven't written in ages! I have a lot to write about, but I am on my little vacation, so I am at Fredrik's house, without my computer. I do have access to his computer, but his computer keyboard is the devil. It's really the most frustrating keyboard I've ever typed on! So...I have pictures and updates about Valentines Day, how my vacation is going and all that. It will be fun. A little catch up and is easy to type, so I don't throw the computer out the window. Reading other blogs has inspired me and here is something I saw on another blog! The necklace Fredrik gave me, along with the necklace my mom sent me for Christmas. The 3 hours we spent at Fredrik's 'mormor' and 'morfar's' house. Grandma and Grandpa. What a wonderful time. The cowboy cookies I made and took to Fika with Fredriks grandparents. Some mail from the marriage office! COME ON! My life here in Sweden and the wonderful week I'm spending with my sweetie. 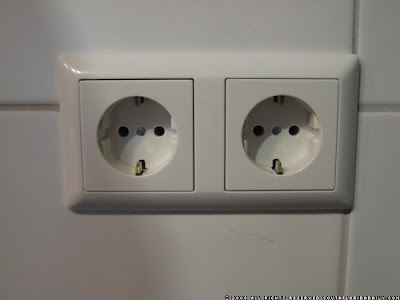 The Swedish thing of the day is the electrical outlet. These are surprisingly hard to pull out of the outlet! And they are so big! 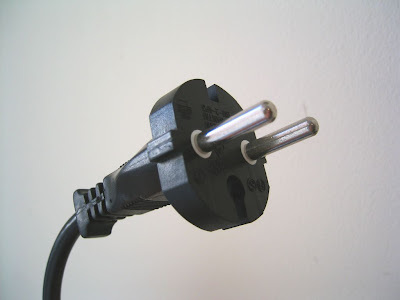 The Swedish word of the day is 'el-uttag' which is 'electrical outlet'. Interesting looking, eh?